We were blessed to be able to attend a memorial service to honor those who have served our country in military service. There were about 200 people in attendance at our local National Cemetery. We want to remember all those who have given of themselves to protect our freedom. We also want to remember those who serve us now. Here is PFC Ryan Fowler with Vice President Biden, whom he met while being part of his security detail in Kosovo. 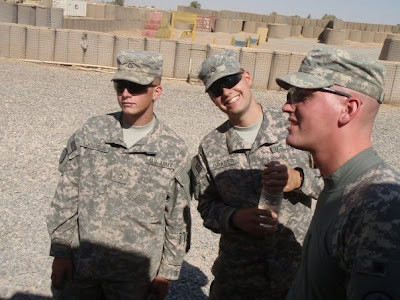 Below is PFC Korn, PFC Graber and Specialist Woodford in a picture taken while serving in Iraq. They are all currently stateside. PFC Fowler is Danielle's fiance and PFC Graber is Erinn's boyfriend. We lift these men and all those serving in our military up in prayer for their safety physically, mentally and spiritually.